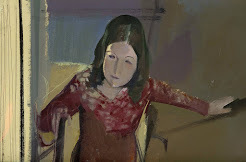 "No matter what Vermeer may suggest or summarize of the outer world or invite the spectator to imagine, wisdom begins and ends in the room, conceived as a cube of shining space in which the figures and their transitory actions seem forever suspended in light." - Frederick Hartt, in A History of Painting, Sculpture, Architecture, New Jersey, Prentice-Hall: 1993. Even bad Presidents make good appointments. When Warren G. Harding, the scandal-prone 29th President of the United States, appointed Andrew W. Mellon to be his Secretary of Treasury in 1921, he was looking for someone to rationalize the recently instituted national income tax system through something Mellon called "scientific taxation." He did not bargain for Mellon, the art collector, who used his tenure at the Treasury Department to lay the foundation for a national gallery of art, to be located in the nation's capitol, and to fill it with his personal collection of Old Masters (Rembrandt, Van Dyke, Botticelli - and Vermeer), to go to the nation at his death. Mellon and, ultimately, all of us, benefited from his perspicacity in choosing his friend Henry Clay Frick to advise him on the finer points of assembling a collection. 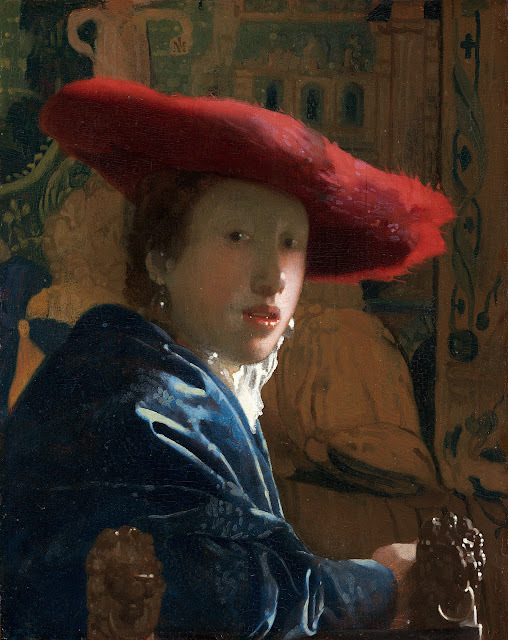 His choice to purchase Vermeer's Girl With A Red Hat from the Knoedler Gallery in 1925 was entirely his own. Mellon fell in love with the little painted panel just as countless others have before and since; he hung it in an intimate place of honor over his piano. Although not so obviously based on the delicate glazes that mesmerize viewers of Girl With A Pearl Earring (c.1665), their cunning use in Girl With A Red Hat harmonizes the muted colors of the tapestry that provides the background for the young woman in her theatrical red hat. And what a hat the artist makes it: feathery strokes of orange shade gradually to vermilion, the underside of the hat definitely deep purple, reflecting light onto her face through flecks of white paint. Both paintings are called tronies, a Dutch term at the time that indicated that the painting was not to be viewed as a portraits The elimination of shadows contouring the face make her eyes that much more in their liquid perfection. This is what luminance does, it makes us see light where it is not but ought to be. Luminance is the term of art for the relative brightness that enables us to interpret three-dimensional space in two dimensional representations. In his own lifetime Vermeer (1632-1675) was a moderately successful painter although his portraits and other commissions were sorely stretched to support the fifteen children Johan and his wife Catharina produced. So it may be unsurprising that no documents in Vermeer's own words have come down to us. Considering the silliness of some of the speculations that have been committed to paper about the origins of Vermeer's paintings, critics might do better to follow Vermeer's own example. Johannes Vermeer - Girl With A Red Hat, c. 1665, dimensions: 9 1/8 x 7 1/8, National Gallery of Art, Washington, DC.